As the twentieth century draws to a close, Maria is at the start of a life she never thought possible. She and Khalil, her college sweetheart, are planning their wedding. They are the perfect couple, "King and Queen of the Racially Nebulous Prom." Their skin is the same shade of beige. They live together in a black bohemian enclave in Brooklyn, where Khalil is riding the wave of the first dot-com boom and Maria is plugging away at her dissertation, on the Jonestown massacre. They've even landed a starring role in a documentary about "new people" like them, who are blurring the old boundaries as a brave new era dawns. Everything Maria knows she should want lies before her--yet she can't stop daydreaming about another man, a poet she barely knows. As fantasy escalates to fixation, it dredges up secrets from the past and threatens to unravel not only Maria's perfect new life but her very persona. Danzy Senna's first novel, the bestselling Caucasia, won the Stephen Crane Award for Best New Fiction and the American Library Association's Alex Award, was a finalist for the International IMPAC Dublin Literary Award, and has been translated into nearly a dozen languages. A recipient of the Whiting Writers Award, Senna is also the author of the novel Symptomatic, the memoir Where Did You Sleep Last Night?, and the story collection You Are Free. She lives in Los Angeles with her husband, the novelist Percival Everett, and their sons. “New People sparkles with precision, and with antic and merciless hilarity. I was seduced into reading it in one sitting, but will be thinking about it for a long time to come. This book—utterly grave, and yet beautifully light-hearted--is a wonder. 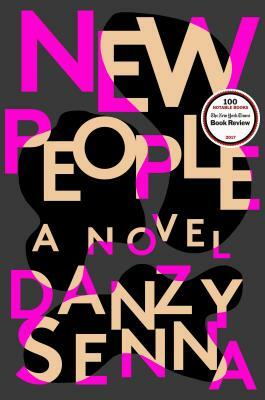 "I stayed up way later than planned to finish New People, Danzy Senna’s riveting, take-no-prisoners, dystopic dream of a novel. More scorcher than satire, New People loads identity, race, despair, and desire into a blender then hits high. Get ready to stay up late, to be propelled, pricked, and haunted." "Danzy Senna detonates the bomb between respectability and desire. In hypnotizing prose, New People kicks you in the gut, then sings you a lullaby. Read this and be haunted. Senna is a master."